Wounded servicemembers at Carl R. Darnall Army Medical Center on Fort Hood, Texas, recently got some help staying connected with loved ones during their recovery. Operation Homelink, in collaboration with the Dell computer corporation, presented 30 refurbished laptops to wounded soldiers participating in the Army Wounded Warrior Program on Dec. 21. 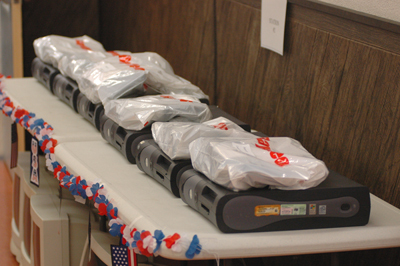 Thirty wounded soldiers received laptops from Operation Homelink and Dell at Darnall Medical Center at Fort Hood , Texas on December 21st, 2007. The Army Wounded Warrior Program serves the most severely wounded, injured or ill soldiers and their families by helping them with their transition back into civilian or military life. Operation Homelink is a supporter of America Supports You, a Defense Department program connecting citizens and corporations with military personnel and their families serving at home and abroad. Having e-mail access during recovery meets soldiers' desires to stay in contact with fellow soldiers and family members, said Dan Shannon, founder and president of Illinois-based Operation Homelink. Troy West, Vice President of Dell-Federal Sales, presents a laptop to Lesley Mansur, retired member of the 4th Infantry Division and participant in the Army's Wounded Warrior Program (AW2). Internet access also allows management of medical and financial matters and provides entertainment, which helps boost morale during extended recovery periods. Laptops provided to the most severely injured soldiers in the program have expanded functionality to run adaptive software and accessories. “We are extremely grateful for Dell's continuing support of our expanded efforts to support our wounded warriors,” Shannon said. 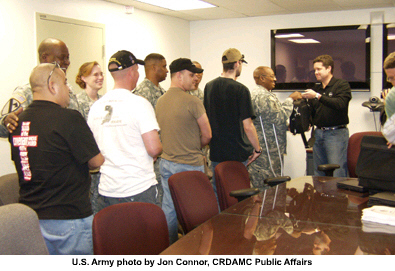 Operation Homelink strives to assist military support programs like Army Wounded Warrior Program by providing refurbished computers, which are donated by sponsors such as Dell. “Dell has a longstanding relationship with the U.S. military,” said Troy West, vice president of Dell Federal. “We are proud to assist programs like Operation Homelink in providing technology that will help soldiers like those in the Army Wounded Warrior Program to not only keep in touch with family, friends and fellow soldiers, but to also assist in their recovery processes.” Formed in 2003, Operation Homelink also provides desktop computers to families of service members so they can stay in touch with deployed loved ones. With this latest laptop donation, Operation Homelink has provided more than 100 laptops to wounded service members. 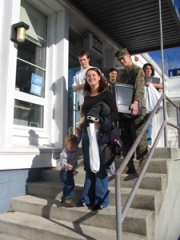 To date, the organization has connected more than 2,500 military families through its donations of laptop or desktop computers. Operation Homelink, an all-volunteer, non-profit organization, in collaboration with Waltham, Mass.-based Raytheon Company, presented 100 computers to the families of Massachusetts National Guard servicemen and women so that they may inexpensively and reliably communicate with their family members serving overseas. 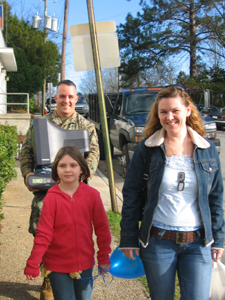 Operation Homelink enables American service members to connect with their families through e-mail using computers donated by companies such as Raytheon. While most service members have access to e-mail while deployed to remote outposts – including sites throughout Iraq – the situation is often different for their families back home. Troops rely on correspondence from family members during demanding deployments, but the families of many junior enlisted members are often not able to afford computers and must rely on conventional mail or expensive phone calls to stay in touch. With today's donation, Operation Homelink has successfully linked more than 2,400 families with their troops overseas. Spouses or parents of troops within the junior-level pay grades (E1-E5) are eligible to receive the donation. Military support agencies help determine the families that will receive computers. The program has enjoyed great success and has expanded to include donations of laptops to wounded service members receiving treatment at military hospitals throughout the United States . Technology providers to Operation Homelink provide professional refurbishment services and ensure all existing information is wiped clean from computers' hard drives. The computers are then tested, reloaded with a new operating system and software and shipped to the selected unit. "We congratulate Operation Homelink for its efforts to help families and deployed soldiers stay connected,” said Rebecca Rhoads, vice president and chief information officer, Raytheon Company. “Raytheon shares the commitment to our heroic men and women in uniform and their families. Operation Homelink provides a way for us to combine high tech with high touch for a very worthy cause." January 16, 2007, Washington, D.C. Marking a milestone, Operation Homelink, in collaboration with Dell, presented 250 refurbished computers to families of the 2nd Marine Expeditionary Force on Jan. 9 at Camp Lejeune, N.C. “With this donation, Operation Homelink has now connected over 2,000 military families,” Dan Shannon, founder and president of Operation Homelink, said. Operation Homelink is a member of America Supports You, a Defense Department program highlighting ways Americans support the nation's servicemembers. While most servicemembers have access to e-mail while deployed at remote outposts, the families of many junior enlisted members are often not able to afford computers and must rely on conventional mail or expensive phone calls to stay in touch, Shannon said. Operation Homelink strives to link American servicemembers deployed overseas with their families through e-mail communication. To achieve that goal the organization distributes refurbished computers donated by sponsors such as Dell, Inc. “We so appreciate Dell's continuing support of our efforts to connect military families with their loved ones serving overseas,” Shannon said. Operation Homelink's technology partner, NewMarketIT of Austin, Texas, provides professional refurbishment services including testing, registration, loading of a new operating system, software and links to military support Web sites. 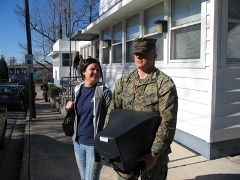 Computers are shipped in bulk to specific military units or geographic areas as designated by the donating corporation. The families of the 2nd MEF were very appreciative to have an easy, inexpensive way to communicate with their deployed loved ones. In the past year, Dell has joined with Operation Homelink to successfully connect more than 800 military families through the donations of refurbished computers. 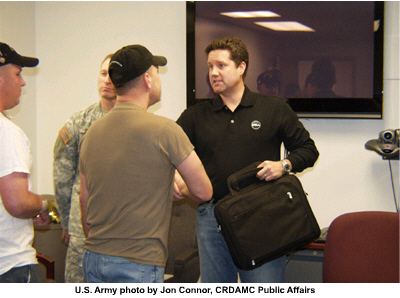 Those computers were presented to families at Fort Hood, Texas, Fort Bragg, N.C., and Fort Campbell, Ky. Additional distributions are planned for later this year. Spouses or parents of deployed servicemembers in the junior-level pay grades of E-1 through E-5 are eligible, Shannon said. Specific families to receive computers are identified by family readiness group leaders. Recent success for the program has enabled the expansion to include donations of laptops to wounded soldiers receiving treatment at military hospitals throughout the United States.